Why clicker train your dog? 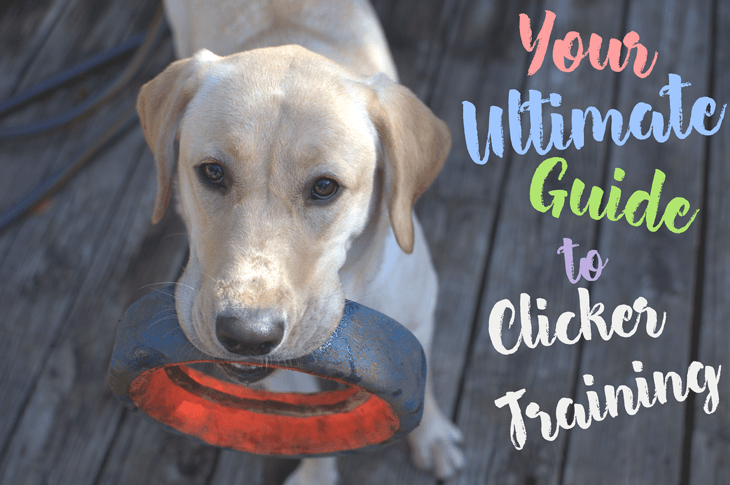 Okay, clicker training is one of my favorite method that I use to train my dogs. It is also one of the most popular ways in dog training that use rewards such as food or toys. It applies the positive reinforcement method from the principles of Operant conditioning, that I talked about it here. A clicker is a device which makes a unique click sound. It tells your dog that you like what he is doing and he’s getting a reward for it. Because we use positive reinforcement in clicker training, you don't have to punish your dog for his mistake. Developing a healthy relationship between you and your dog. You can use this method to train all kinds of dog and puppies. From the youngest to the oldest, smallest to the biggest and every kind of breeds. Which is why clicker training is one of my favorite training method​. It can also help remove unwanted behavior. How? Its simple. If you reward your dog for the desired behavior and don't reward him for the unwanted behavior. He will eventually forget about the unwanted behavior. ​The clicker is a very effective tool in training your dog because of the sound it makes. It sounds unique and the same no matter what. How TO USE A DOG CLICKER? Since clicker training works using positive reinforcement to reward your dog’s behavior. It’s a really simple process. Start by charging the clicker. Charging the clicker? What's that? Nope, charging the clicker means before starting the training you’re warming up your dog to the clicker by telling him that you like his behavior with a click and he’s getting a reward for it. Find a quiet room and sit with your dog, remember to have some delicious treats with you. Press the clicker and give your dog a treat afterwards. Some clickers can be loud, so try to muffle the sound of the clicker if it's your dog’s first time. Keep in mind that you are clicking for the behavior you want. Once you finished this process, you can start teaching your dog some basic obedience​. There are 5 ways on how to clicker train a dog's behavior. I'll list them below and go through each one of them. Shaping basically is you rewarding your dog every time he's close to achieving the desired behavior you want. You click and reward him for lying down. You click and reward him for rolling on his back. You click and reward him for lying on his back. Finally, you click and reward him for rolling over. I do each action step by step to complete the full behavior, from lying down to rolling on his back to lying on his back. That’s what you should be doing as well. You see how I always keep rewarding him, because that’s how positive reinforcement work. Don’t forget to click before the reward. Luring is rather easy and simple. You basically lure your dog with a treat inside your hand until he has accomplish the desired behavior. Place a treat inside your hand. Hold it in front of your dog. Lure your dog with your hand in a circular ​motion. Click and reward him once he completes the motion. Capturing is pretty tricky, you have to be very observant. You wait until your dog performs the desired behavior you want, and you have to click immediately and reward him. Keep a close eye on your dog. Wait until he lays down. It’s actually pretty simple once you get the hang of it. The tricky part is waiting for your dog to perform the behavior or action you want. Modeling is a bit hard. Modeling is teaching your dog to model or copy your behavior. It isn't easy for dogs to learn new behavior by copying us humans, so I use a well trained dog instead of myself. It allows your dog to learn at a much quicker pace. For easier reading, I’ll call the well trained dog, Max and the untrained dog, Cody. Click and reward Cody if he performs the action. Keep trying until your dog performs the behavior or action you want. This method is especially helpful if you already have a dog who is well trained. The last of the five. Molding is an easy one. It basically means that you help your dog perform the desired behavior by physically moving his body into a correct position. Shake hand with your dog. It’s a straightforward method, but your dog may not always like it. Okay let’s begin with teaching your dog to sit. All you have to do is click when your dog sits and reward him, sound easy right? Have a treat and hold it in front of your dog's nose and raise it until you lure him to a sit position. Repeat the process several times and start adding in a cue word "sit"
​Teaching your dog to come to you is easy. Recalling your dog using come can stop him from chasing animals or cars, which can be very dangerous. To begin, click whenever your dog takes a step towards you and give him a treat. Distance yourself from your dog and repeat the process. Start adding a cue word “come” later on. Always follow a treat with a click no matter what, even by accident. Never use the clicker to get your dog's attention. Practice in short session instead of long session. Have a treat pouch to make it easier for you, it's not necessary but makes your life easier. ​Q: Why can't I just use my voice saying good, yes, etc instead of using the clicker? Q: My dog doesn't like or eat the treats I give him. A: Find a better treat for your dog such as Greenies Pill. Train him when he's hungry, never train him after his meal because he'll be satisfied. If your dog still doesn't like the treat, you could try using your dog's favorite toy instead of a treat. Q: Do I have to use the clicker and treat forever? A: No, you don't need to. We use clicker training to teach your dog new behavior and once they've learn the behavior, it isn't needed anymore. Q: How do I fix my dog's bad behavior with clicker training? A: Here's an example on how to fix bad behavior. If your dog goes all over a visitor. Next time if a visitor comes again, click when he behaves himself, instead of shouting and scolding your dog. Let's wrap this up with a question. What do you guys think about the clicker training? Comment down below! Allison here from Pupfection! I was fostering homeless dogs for more than 2 years and currently traveling. And now here to share my tricks, tips, and reviews related to dogs and puppies on Pupfection.